The Higgs boson, discovered at the Large Hadron Collider (LHC) in 2012, has a singular role in the Standard Model of particle physics. Most notable is the Higgs boson’s affinity to mass, which can be likened to the electric charge for an electric field: the larger the mass of a fundamental particle, the larger the strength of its interaction, or “coupling,” with the Higgs boson. Deviations from these predictions could be a hallmark of new physics in this as-yet little-explored part of the Standard Model. Higgs boson couplings manifest themselves in the rate of production of the Higgs boson at the LHC, and its decay branching ratios into various final states. 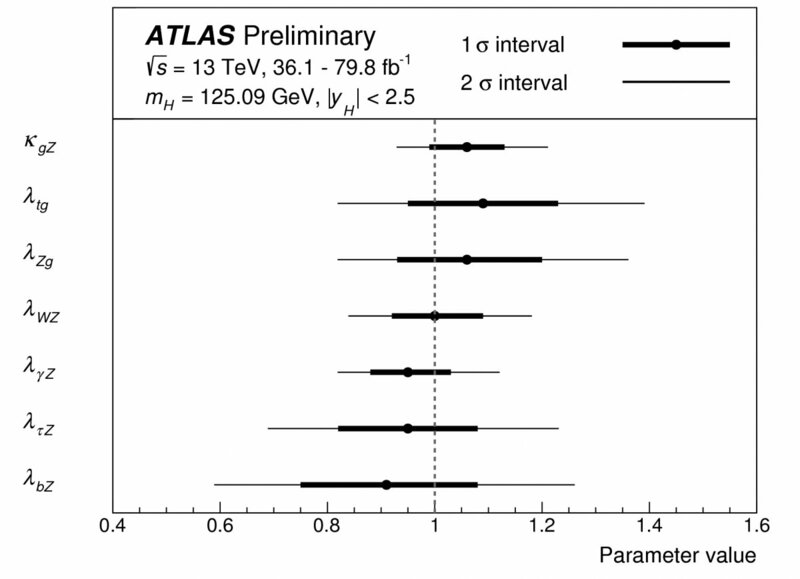 These rates have been precisely measured by the ATLAS experiment at CERN, using up to 80 fb–1 of data collected at a proton-proton collision energy of 13 TeV from 2015 to 2017. 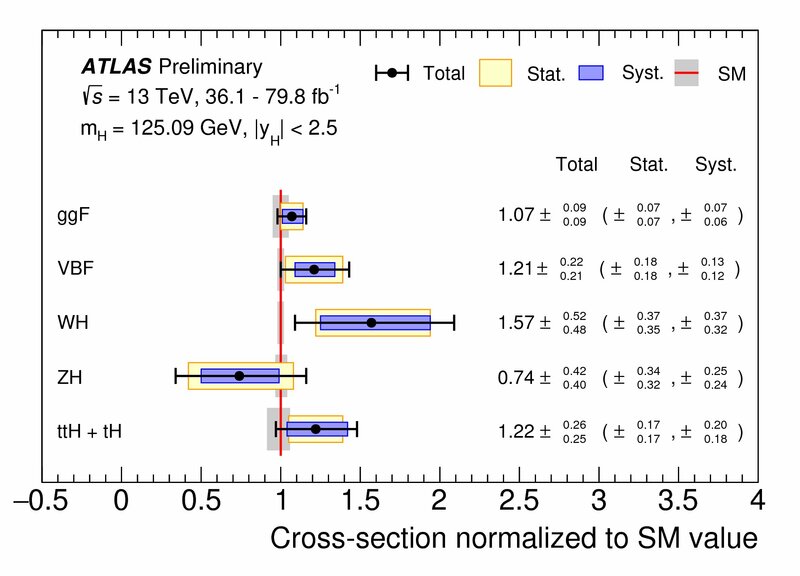 Measurements were performed in all of the main decay channels of the Higgs boson: to pairs of photons, W and Z bosons, bottom quarks, taus, and muons. The overall production rate of the Higgs boson was measured to be in agreement with Standard Model predictions, with an uncertainty of 8%. The uncertainty is reduced from 11% in the previous combined measurements released last year. Physicists can use these new results to study the couplings of the Higgs boson to other fundamental particles. These couplings are in excellent agreement with the Standard Model prediction over a range covering 3 orders of magnitude in mass, from the top quark (the heaviest particle in the Standard Model and thus with the strongest interaction with the Higgs boson) to the much lighter muons (for which only an upper limit of the coupling with the Higgs boson has been obtained so far). The measurements also probe the coupling of the Higgs boson to gluons in the gluon-gluon fusion production process, which proceeds through a loop diagram and is thus particularly sensitive to new physics. In the Standard Model, the loop is mediated mainly by top quarks. Therefore, possible new physics contributions can be tested by comparing the gluon coupling with the direct measurement of the top quark coupling in Higgs boson production in association with top quarks, as shown in Figure 2.